Happy Friday, y'all! I'm definitely ready for the weekend - are you? Before we split for the weekend, I wanted to share a photo of this beautiful kitchen from Beneath My Heart. Traci renovated her kitchen a couple of years ago, and the before and afters are just stunning. Check out this post for more photos. If you like my style, I guarantee you'll like hers :). So what are the "creative bits" I like most about this little corner of her kitchen? Let's start with those open shelves. The pretty white shelves and corbels make a perfect backdrop for displaying her pretty dishes, glassware and other kitchen items. They really pop against that white, don't they? 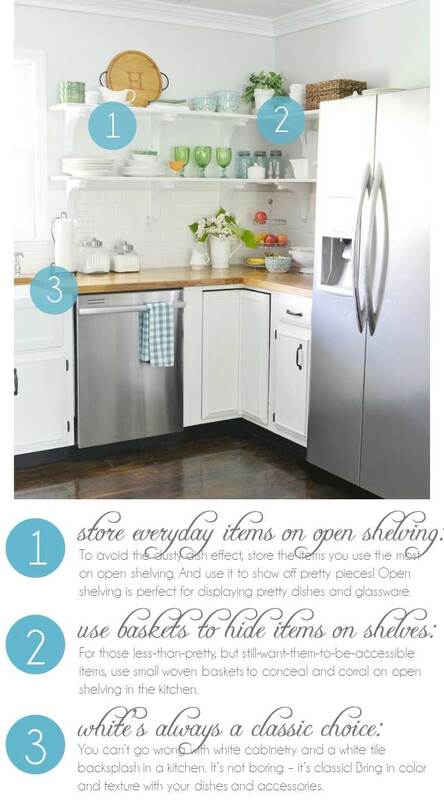 One hint I've heard over and over is that you should store your everyday, most-used items on open shelves. That way, you avoid the "dusty dish effect." But don't worry, you can still keep less than pretty items on open shelving too - just use a basket to corral them! The basket looks great up there, and has the advantage of providing some great texture and depth to the shelves. And lastly, I believe that you can't go wrong with a predominantly white kitchen. I will say that this is totally personal preference though and you may disagree with me (which is fine! ), but I just love the classic look. I like how Traci paired the white cabinets and tile back splash with those gorgeous butcher block counter tops too. The fact that you can bring in any color you want through the dishes and accessories make it so that all-white kitchens can fit with nearly anyone's style. You can change things up without having to redo your whole kitchen :). So what do you think? Are you in love with this kitchen as much as I am? Hope y'all have great weekends! Totally agree on the white kitchen. I'm in the process of painting all our cabinets white and a white tile backsplash is next...which in DIY time means probably three months from now! Though, I think I may need to re-style my open shelving now that I've seen this photo!